Today’s order delivered by the Forest Bench of the Supreme Court, lifting the ban on mining at 18 A-category mines of Karnataka subject to statutory clearances, is unlikely to open the floodgates to the resumption of mining activities in the state. Four days to go for the end of monsoon session, the UPA-led government found itself cornered today after the BJP joined the remaining Opposition in seeking the cancellation of the allocated coal blocks as a condition for Parliament to run. Even as the inter-ministerial group (IMG), which met here today, reviewed the norms and procedures for the allocation of coal blocks and the performance of the companies, which were given these blocks, reports suggested that procedurally it would not be easy to meet the Opposition's demand to cancel coal-block allotments. A Jharkhand MLA today tore off his shirt in the Assembly to press for a slew of Opposition's demands amid din in the House, leading to adjournment of the House. On a day that the Chinese Defence Minister arrived in New Delhi, his Indian counterpart AK Antony, in a separate development, today told Parliament that China has been asked to cease all infrastructure development works in Pakistan-occupied Kashmir (PoK). Pressed by the BSP, the UPA government has convened a special meeting of the Union Cabinet tomorrow to clear a Bill providing for reservation in promotions for SC/ST employees. A petition challenging the state government’s denial of advertisement and patronage to some newspapers was admitted at the Calcutta High Court today. 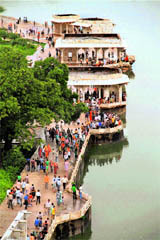 The Supreme Court today questioned the Centre on the delay in holding a meeting of the Cauvery River Authority (CRA), set up to resolve the dispute primarily between Tamil Nadu and Karnataka over sharing the river water. Political parties in Andhra Pradesh are smitten by the media bug. The state units of the BJP and the CPM are planning to launch their own television channels, which will serve as platforms to spread their political ideology and counter their rivals’ campaign. The rising number of cases of swine flu in Lucknow, 56 so far, has started a blame game between the state health department and the Sanjay Gandhi Post Graduate Institute of Medical Sciences (SGPGI). If you are under the impression that the expensive pan masala or gutka is safe, please think again. New evidence shows that whether low-priced or expensive, consumption of such products substantially increases one’s chances of cancer. Ahmedabad, September 3 Gutka and pan masala will be completely banned from September 11 in Gujarat, a notification issued here today by the state government said. Former Uttarakhand Chief Minister ND Tiwari today questioned in the Supreme Court the legal validity of the DNA report that has shown he is the biological father of 33-year-old Rohit Shekhar. The Army has been entrusted by the government with the task of tracing and getting hold of illegal arms and ammunition available in violence-affected districts of Bodoland Autonomous Territorial District Council (BTC), including Kokrajhar, Chirang and adjoining Dhubri, in view of the occurrence of sporadic incidents of violence in those areas despite heavy presence of the Army and Central paramilitary forces. Closing ranks behind nephew Raj Thackeray who heads the breakaway Maharashtra Navnirman Sena, Shiv Sena supremo Bal Thackeray hit out at Bihar Chief Minister Nitish Kumar for his remarks against the former. In fact, only one company will resume its work of extracting iron ore from its mine in Chitradurga district of Karnataka immediately in the wake of the apex court’s order. The remaining 17 companies have been listed as A category companies because there is no evidence against them of indulging in illegal mining activities. But these companies do not have all the necessary clearances. They will have to wait and procure the clearances before resuming mining operations. SR Hiremath of the Samaj Parivartana Samudaya (SPS), the NGO which had moved the court demanding a ban on mining due to the environmental damage caused by the rampant mining activities, said he was happy with today’s court order. “The court has made it clear that all the statutory clearances will have to be obtained for carrying out mining activities. Earlier, the state government used to put pressure on various regulatory agencies to give the mandatory clearances disregarding the consequences. This will no longer be possible,” Hiremath said. “Initially, only one company will benefit from the order. The others will have to get the clearances first and then start mining. We have nothing against mining if it is properly regulated,” Hiremath added. Basant Poddar, managing director of Mineral Enterprises Limited (MEL), the only mining company in Karnataka, which has all the necessary clearances, said they would start their operations from tomorrow. The MEL, which sustained losses to the tune of Rs 30 crore during the one-year period when mining was banned by the Supreme Court, had retained all its workers, Poddar said. The Supreme Court, following a recommendation by the Central Empowered Committee (CEC), which has been constituted by the court to watch over forest and wildlife-related matters, first banned mining in the Bellary district of Karnataka in July last year and later extended the ban to Chitradurga and Tumkur districts. The ban had mostly affected the iron ore mines. While the ban gave much-needed relief to the biodiversity and environment of the three districts, particularly Bellary, it had hit hard the steel producers as well as the local economy and workers employed at mines. Secretary-general of the Federation of Indian Mineral Industries (FIMI) RK Sharma said a total of 142 mines were affected by the ban on mining imposed by the Supreme Court. “Some of the companies have retained their workers while others have retrenched them,” he said. He expressed hope that with the Supreme Court today partially lifting the ban on mining, things would again become “normal”. Vinay, a Bellary-based journalist, said renting of houses and the lorry business (for transportation or iron ore), which flourished in Bellary during the heydays of mining, are languishing now. “May be these businesses will pick up again,” he said. Basant Poddar, who is also the vice-president of FIMI, said activities connected with mining like the railways and the ports had also been hit hard by the ban. As the government rejected the demand and another day was lost in both Houses, the BJP and the Left blamed the UPA’s “obduracy” for disruptions in Parliament proceedings. “The Opposition wants the Houses to run. The Leader of the Opposition in the Lok Sabha said yesterday that they were prepared to debate the coal scam if the government cancelled all controversial allocated coal blocks and ordered an independent probe into the matter. The government’s obduracy is stalling Parliament,” Syed Shahnawaz Hussain, BJP spokesperson, said today. He insisted that the BJP had not climbed down on its principal demand of resignation of Prime Minister Manmohan Singh who was the Coal Minister at the time of the allocations of coal blocks, which CAG has termed as non-transparent. “That demand remains. We will press for it when we debate the matter in Parliament. Just as A Raja resigned having presided over the 2G Spectrum scam as Telecom Minister, the PM must resign having owned responsibility for irregularities in coal-block allocations. We have joined the Opposition line to find a way for Parliament to run,” Hussain said, defending the BJP, which had earlier set the PM’s resignation as the first demand for a parliamentary debate. The party was naturally hunting for an exit route though it may not admit so. That explains Hussain’s jibe following CPM leader Sitaram Yechury’s remarks today that the BJP Congress match fixing was nearing an end and the BJP had come around to the Left’s demand on the cancellation of coal-block allocations. “The Left may say what it wants but the fact is it is Congress’ B Team,” Hussain retorted. That apart, with this latest move, the BJP has placed itself in line with the NDA partners, the JDU and the Akali Dal, who have been seeking a debate following the cancellation of coal blocks. The BJD is the sole Opposition party not seeking cancellations on the ground that 18 of these were recommended by the BJD government of Orissa led by Naveen Patnaik. Importantly, even on cancellations, the BJP and the Left are divided. While the former wants all the 142 coal blocks allocated by the UPA starting 2004 (for captive coal mining to public and private steel, iron and cement makers) cancelled, the latter is against cancelling the ones allocated to public sector companies. “We don’t want the cancellation of coal blocks allocated to public firms because they are giving us power. There are 90 allocations, which, by the government’s admission, are fraught with irregularities. Of these, 57 are the ones CAG reviewed; the rest have private players flouting contract rules,” said Yechury. The procedure adopted for the allocation of coal blocks (now being called the coalgate) has been responsible for the continuing logjam in Parliament for the past nine days. Official sources said the IMG in no way could cancel the coal block allocations. It can only review and suggest measures to the government and it would be difficult to get de-allocation done by September 15. The government has set September 15 as deadline for a decision on the de-allocation of coal blocks where work has not started. The IMG, which met here in the evening, reviewed a total of 58 blocks and has decided to seek an explanation from the companies before going ahead with its recommendations. It is expected to meet again later this week for another review. An official statement issued after the IMG meeting said, “The group, which has been constituted for a periodic review of coal blocks, met today to deliberate upon the replies to show-cause notices issued to the coal-block allottees on account of slippages in attainment of milestones for development of coal block, including bank guarantee. The IMG has fixed a schedule for meeting on 6th, 7th and 8th September, 2012, during which the allottees will be given an opportunity to be heard and present the reasons for the delay, if any”. The latest progress as reported by the Coal Controller will also be taken into account before recommending on the action against the coal-block allottees. The IMG has also firmed up the guidelines for proportionate deduction of bank guarantees for failure to achieve milestones for development of the block, the statement said. A total of 148 blocks allotted to private players since 1993 are under scrutiny. The panel has first taken a look at 58 blocks, which had been issued show-cause notices in April. It has found that 30 blocks allocated to private sector companies and another 28 to state-run companies deserve to lose their licences for non-performance. As soon as the Assembly convened at 11 am, Opposition members trooped into the Well of the House raising a din. 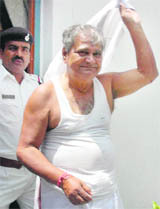 Amid the noisy scenes, Jharkhand Vikas Morcha (P) MLA Samresh Singh tore off his shirt, prompting Speaker CP Singh to first adjourn the House for an hour. In a written reply in Parliament, Antony said the government was aware of the infrastructure development by China at the border and its undertaking of infrastructure projects in Pakistan-occupied Kashmir (PoK). “We have conveyed our concerns to China about their activities in PoK and asked them to cease such activities,” he said. China, he said, disputes the international boundary between India and China. There is no commonly delineated ‘Line of Actual Control’ (LAC) between the two countries. He said, “There has been no Chinese intrusion into Indian territory in the past three years. 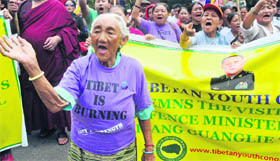 However, Chinese patrolling as far as their perception of the LAC are treated as transgressions.” Such incidents of transgressions are taken up with the Chinese side through established mechanisms such as hotlines, flag meetings, border personnel meetings and the newly established working mechanism on consultation and coordination on India-China border affairs. The BSP, which is extending crucial outside support to the UPA government, has been insisting that the Bill be passed in the ongoing Parliament session. That will prove to be difficult as the last week of the ongoing session is not expected to transact any business since the BJP has made it clear that it will not allow Parliament to function till its demands on Coalgate are met. The proposed legislation is a Constitutional Amendment Bill requiring a vote and cannot be passed in a din. However, impatient BSP members have been calling up senior UPA ministers to push through the Bill at the earliest. Although the government cannot ensure the passage of the Bill, it has convened a special Cabinet meeting tomorrow specifically to clear this Bill to signal that it is serious on this issue. Cabinet meetings are usually held every Thursday. After BSP chief Mayawati made a strong pitch for the Bill in the Rajya Sabha last month, PM Manmohan Singh had rushed to convene an all-party meeting on August 21 to forge a consensus on providing quotas in promotions for SC/ST government employees. Unable to veto such a politically sensitive proposal, all political parties had given their consent to it. The Samajwadi Party, the BSP’s arch political foe, was the only party which opposed the move and wanted this provision to be extended to OBC employees. 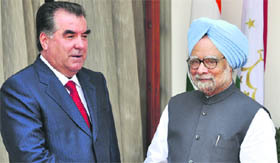 The SP also extends outside support to the UPA government. Although it has necessarily to do a balancing act between the demands of the SP and the BSP, the government has worked overtime to draft a Bill on quotas in promotions. The country’s top law officer Attorney General GE Vahanvati had cautioned that the Constitutional amendment proposed by the government could be challenged in court. He had pointed out that the proposed legislation requires proof of under-representation of SC/STs in services, efficiency of administration and extent of backwardness, the conditions laid down for clearing reservation in promotions. Following the AG’s advice, the government is learnt to have decided to remove these two clauses. The petition was filed by ‘Ganashakti’, a Bengali newspaper published by the CPM state committee at Alimuddin Street party office. It was alleged in the petition that ‘Ganashakti’, a Bengal daily which has a circulation over 2 lakh, had been suddenly denied the state government’s advertisements at the “order” of Chief Minister Mamata Banerjee for being “an official mouthpiece” of the CPM. Hence, it could be, in no way, acknowledged as a newspaper and granted government advertisements. The state government has also banned the buying and distribution of ‘Ganashakti’, two English and three Bengali dailies by various departments and state libraries. Instead, some new Bengali papers with little circulation published under the patronage of the TMC had been included in the list for government advertisement and patronage, it has been alleged. Chief Justice JN Patel’s Division Bench today directed the state government to submit its affidavit within the next four weeks after which the next hearing of the case would take place. Incidentally, another single Bench of the HC will also simultaneously conduct a hearing on the public interest litigation against the arrest of and harassment to Jadavpore University professor Ambikesh Mahapatra and Dilip Sengupta, a septuagenarian resident at Jadavpore housing complex, over the cartoon controversy involving Mamata Banerjee and her two colleagues Dinesh Trivedi, former Railway Minister, and his successor Mukul Roy. Prof Mahapatra and Sengupta had been granted bail by the Alipore court. The West Bengal Human Rights Commission (WBHRC), which started a separate probe into the case, has slammed the state government and recommended a special inquiry into the arrest. The commission also ordered a compensation of Rs 50,000 each to the duo by the government. A Bench comprising Justices DK Jain and Madan Lokur wanted to know from Additional Solicitor-General Harin Raval as to what was coming in the way of convening a meeting of the CRA headed by PM Manmohan Singh. The ASG said the PMO had written to the CMs of Tamil Nadu, Karnataka, Kerala and Puducherry asking about a convenient date for the meeting and that their response was awaited. “The PM is to see his own convenience or that of others? Sometimes we are short of words when it involves the highest functionary of the government,” the Bench remarked. The saffron party is giving finishing touches to its Telugu news channel “Orange TV”, to be run from the four-storied office building of the party at Nampally in the city. “We will go on air within six months. The channel will provide a platform for people to debate the party’s political ideology and promote value-based politics in society,” state BJP president G Kishan Reddy said. The channel is also expected to serve as a powerful tool to strengthen the Telengana statehood movement being pursued vigorously by the party. The BJP and more than 60 social organisations that share its ideology hope that “Orange TV” will help further their cause and consolidate the vote bank of the saffron party ahead of the 2014 general elections. The Marxists, on the other hand, are also starting their own TV channel, christened “Red TV”. The recruitment for “Red TV” is in full swing, sources said. The CPM already runs a Telugu daily, “Prajasakthi”. Ironically, the BJP and the CPM foray into news channel business comes in the backdrop of a grim financial situation prevailing in the electronic media sector. There are more than 14 news channels in Andhra Pradesh. Barring a few exceptions, none of them is in the pink of financial health. Over the past several years, the state has been witnessing a growing symbiotic relationship between political parties and the media. “There is a growing trend of political agendas dominating the electronic media with their owners having strong political links,” senior journalist and political commentator T Ravi said. The popular channel, “Sakshi TV”, is owned by the president of the YSR Congress and jailed MP YS Jagan Mohan Reddy. In fact, the investments into his media group, Jagathi Publications, came under the CBI scanner and kicked off a major political controversy. Similarly, the “T channel”, an overtly pro-Telengana channel, is owned and managed by the sympathisers of the Telengana Rashtra Samithi (TRS). Its studio and office are located in the TRS headquarters here. Till Monday evening, 56 confirmed cases afflicted with the deadly H1N1 virus have been reported from Lucknow alone. According to Lucknow chief medical officer Dr SNS Yadav, all these cases of swine flu in the state has been reported from Lucknow alone. Only two patients had come from Madhya Pradesh. According to him 90 per cent of these cases were in and around the SGPGI on Rae Bareli road involving its staff, technicians or patients from neighbouring areas like Telibagh, who visited the SGPGI OPD for treatment. Dr Yadav said the state health department is considering undertaking a research study in collaboration of the Department Community Medicine at King George Medical University (KGMU) and the Community Health Centre at Mohanlalganji near the SGPGI in Lucknow to understand this phenomenon. “I have already spoken to the professor and head of the community medicine department at KGMU Dr JV Singh to undertake the study in the near future, “ said Dr Yadav. Examination of 18 different high end brands of pan masala and gutka by the prestigious John Hopkins Hospital in Baltimore in the US has revealed that each one of them in varying amounts has presence of cancer-producing chemical Gambier. The cancer producing properties detected in the 18 brands range between 1.09 to 13.73 per cent. The exercise is part of an ongoing research based anti-cancer advocacy which aims at disseminating information to the public by exploding commonly health beliefs regarding cancer. Expensive tobacco products, pan masala and gutka, are relatively safe is one such myth. Gambier, gambeer or gambir found in all brands sent for examination is a cancer causing catechu (katha) substitute. The increasing demand of katha for use in pan masala, gutka and natural dye for hair had necessitated the search of an alternative source. White cutch or gambier is extracted from Uncaria gambier found in Malaysian region and has the same uses but very different chemical properties as even scientists from Forest Research Institute, Dehra Dun, have admitted it has irritant properties. Catechu manufacturers are increasingly using this prohibited gambier in place of the ‘khair’ katha. While manufacturers say gambier is not hazardous and is a suitable substitute, cancer experts differ. Approximately 2.5 lakh people are struggling with cancer in UP. Of this, 75,000 are cases of oral and mouth cancer mainly due to tobacco chewing and use of gutka and pan masala, said Dr Dixit. Gutka and pan masala will be completely banned from September 11 in Gujarat, a notification issued here today by the state government said. The ban as per provisions of Food Safety and Standards Act, 2006 on manufacturing, sale, storage and distribution of gutka and pan masala will come into effect from September 11, and initially shall be in place for one year, Gujarat's Commissioner of Food Safety Dr H G Koshia said. "It has been done in public interest," he said. Any violation of ban on food articles containing nicotine and tobacco as ingredients, would attract atleast six months of imprisonment and a fine upto Rs 5 lakh, Koshia said. However, the prohibition shall not be applicable in respect of 100 per cent export oriented units. Citing research at Tata Memorial Hospital, the notification said it was observed that consumption of gutka and pan masala causes carcinogenic and co-carcinogenic effects, leading to very high risk of oral cancer. High Court should be decided following the proper legal procedure. Senior counsel PS Patwalia, appearing for Rohit, countered the contention, describing Tiwari’s conduct as disdainful. The Judges, however, clarified that the case would have to go to the bench headed by Justice Aftab Alam which had heard the matter earlier and asked the parties to be prepared for the next hearing within two weeks. The bench asked Rohit to place all the relevant documents, including the HC orders, relating to the recent developments in the case on the SC records. There have been allegations from various quarters that the availability of illegal arms with many elements in the BTC area was one of key reasons behind the escalation of violence last month. In fact , violence was stoked by a shootout incident during the night of July 19 when motorcycle-borne miscreants opened fire at two youth leaders of a religious minority community. A Defence source said the Army had launched a special operation in Kokrajhar district under the BTC in search of illegal weapons and the operation would be extended to other affected districts like Chirang and Dhubri later on. The Union Home Ministry is well aware of the threat posed to the social peace in the BTC area due to the availability of illegal weapons in the area and the previous Union Home Minister P Chidambaram during his visit to the violence-affected areas had admitted that it was a matter of concern. The BTC area was home to a large number of former militants belonging to the now disbanded Bodo Liberation Tiger (BLT). The BLT leaders formed the Bodo People’s Front (BPF) after the signing of the Bodo Peace Accord in 2003 with the Centre and the party is now in power in the BTC. Various religious organisations of the minorities allege that many of the former BLT men were still in possession of illegal weapons. On the other hand, Chief Minister Tarun Gogoi has not ruled out the involvement of radical and fundamentalist elements behind the recent spell of riots between the Bodos and the Muslims in the BTC and adjoining areas. The anti-talks faction of the National Democratic Front of Bodoland (NDFB), led by its chairman Ranjan Daimary, who is now in jail, also called off its unilateral truce with the Central forces in the aftermath of the BTC violence raising apprehensions that its cadres might train guns on the people of a minority community. In a write-up in the party’s mouthpiece “Saamna”, Bal Thackeray heaped abuse on Kumar. “Instead of criticising others, he (Nitish Kumar) should have congratulated the Mumbai police for arresting the traitor,” Thackeray wrote. The Shiv Sena chief said the youth Abdul Qadir, who was arrested by the Mumbai police at Sitamarhi in Bihar, could have created trouble in his home state, which was averted by the Mumbai police.